What Is Happening with Super Troopers 2? There are very few comedy sequels that actually manage to be as good as the original, and even fewer that manage to be better. Fans of Broken Lizard's 2002 cult comedy Super Troopers are hoping that the long-awaited sequel can be one of those few movies, and we are a little bit closer to finding out if that is going to be the case. The Broken Lizard gang recently announced that, after a break, the final days of filming on Super Troopers 2 have finally begun. Thanks to a few updates from Broken Lizard's Twitter account, we know that the boys are heading to Boston to finally wrap up shooting the crowdfunded sequel. In a recent update to the Indiegogo page, Erik Stolhanske said that shooting is expected to commence in the first week of September, and that they were only a few weeks away from finally finishing the movie. The update also mentioned that those who contributed enough to the campaign to be a producer or actor in Super Troopers 2 will be filming their scenes during this time period. "Cameras start rolling the first week of September! That means, if you're a Featured Extra, Producer or VIP Set Guest, it's finally time to make plans! One of our producers emailed all of you earlier this week, but if you didn't get your invite, let us know ASAP"
Super Troopers 2 was originally supposed to be released this summer, but certain delays have prevented that from happening. Those who backed the movie can rest assured with this new information that the movie is on track, and will be coming out at some point in the relatively near future. Earlier this year we reported that director Jay Chandrasekhar was in the middle of trying to resolve a legal issue surrounding the movie that had to do with Fox, which has apparently been cleared up. Here is what he had to say about it. "We have a legal situation we have to sort of resolve with Fox, before Super Troopers 2 can happen. We're close to some resolution, one way or another. We don't know." As of right now, we still don't know a lot of plot details regarding the Super Troopers sequel, but as filming wraps up over the next few weeks, we are surely going to be getting some more updates. There is no release date set for the movie, but it has reportedly already secured distribution, which should mean we get to see it sooner rather than later. 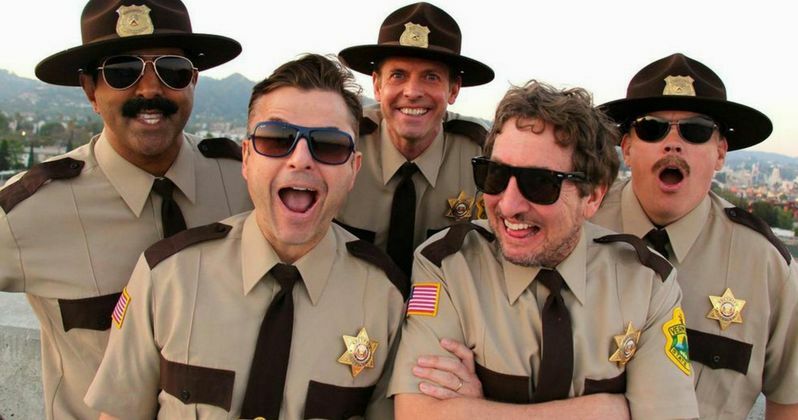 We will be sure to keep you updated as more details on Super Troopers 2 becomes available.